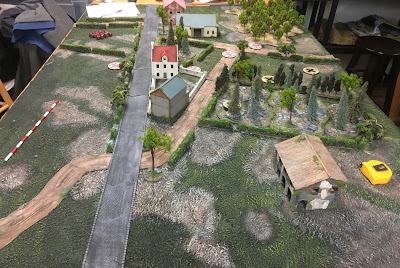 We played our 4th game in the Marlet campaign this past Saturday, again at the Hobby Bunker. This was scenario 3 (Attack and Defend) from the book and scenario 2 in the campaign. 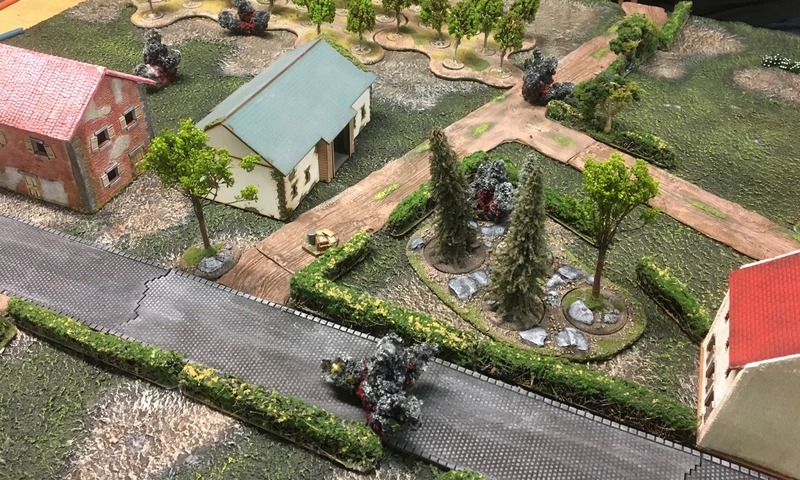 This is quite a different game from the first scenario as there is no specific objective and the terrain was quite busy with very little clear LOS and a lot of cover. British approach in the far ground, the only direct LOS is down the asphalt road. The forests block LOS even from the second story windows of the houses. Final position of the Patrol Markers, you can see my new dice. Position of the JOPs. 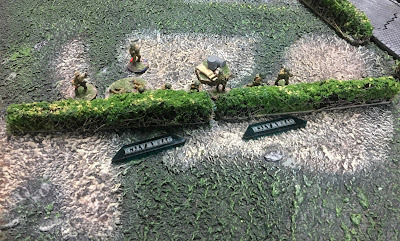 I believe I should have been a little more aggressive in my push forward, as you can see the German JOPs are barely in front of the their start line. Mike got 10 and I got 8 on Force Morale. This is low starting FM for the British has been a continued handicap. Mike is +3 on his FM throw and I am -1, so it will continue. We both started this game with depleted platoons, I was missing 8 men and Mike 2. We had gone 4 games and I was just starting on table 2, this is going to be a tough campaign for me to win. To get a marginal victory, I have to take 6 tables by turn 11 (we added a turn on the first day due to errors that favoured the Germans). So I have 1 table at turn 4! I decided to not take an extra infantry and more to rely on Armour. I thought Mike might take an extra Panzer IV, guessed wrong. 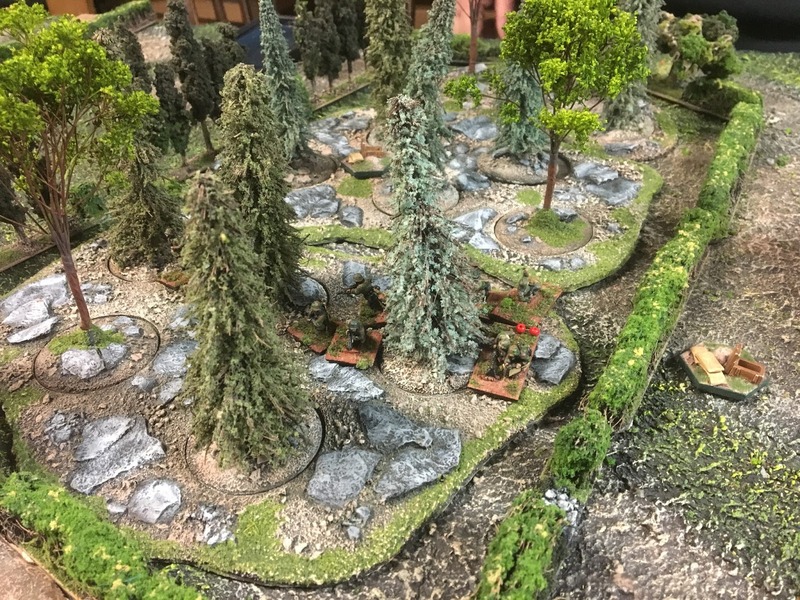 Mike decided to buttress his panzergrenadier squads with riflemen. My new dice served me relatively well in this game, but unfortunately at the wrong times. I got 6 free moves with my patrol markers, I think I could have been a little more aggressive with my push forward but I wanted my advance to be on a broad front. In the first several throws of the Command Dice, I got 3 double sixes, but unfortunately this was of little value in this Attack and Defend game as Mike had a lot of difficulty getting his troops on the table because of the British Artillery Barrage. 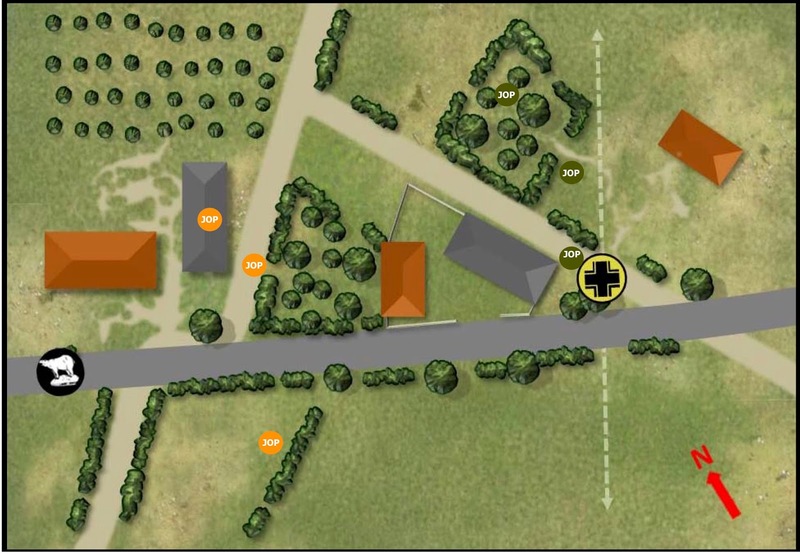 Lots of moves but to where, there were no German units to attack. I probably could of captured a JOP but this was of little value early in the game as I did not have a Chain of Command dice. All the German JOP's were in exposed positions and close together which would have made them hard to hold on to. Notwithstanding this, I advanced one section up the road under the cover of smoke and easily captured the central compound. I also deployed my Bren team with a JL in the barn which had the JOP in it. There was one slit which allowed a clear LOS up the dirt road to the forest where I suspect Mike would deploy his troops. Mike deployed his Panzer IV on his left flank, so I deployed my Firefly. Twelve d6 vs 6d6 (should be a piece of cake), I had 3 shots at the Panzer IV, hit it each time and the best I could do was equal hits! Mike fires back at the Firefly, kaboom, down 2 FM. 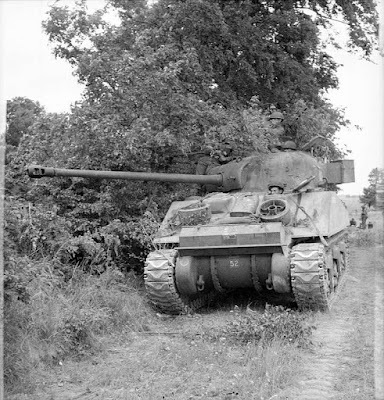 I bring on my Sherman, again I hit it twice, again no damage. 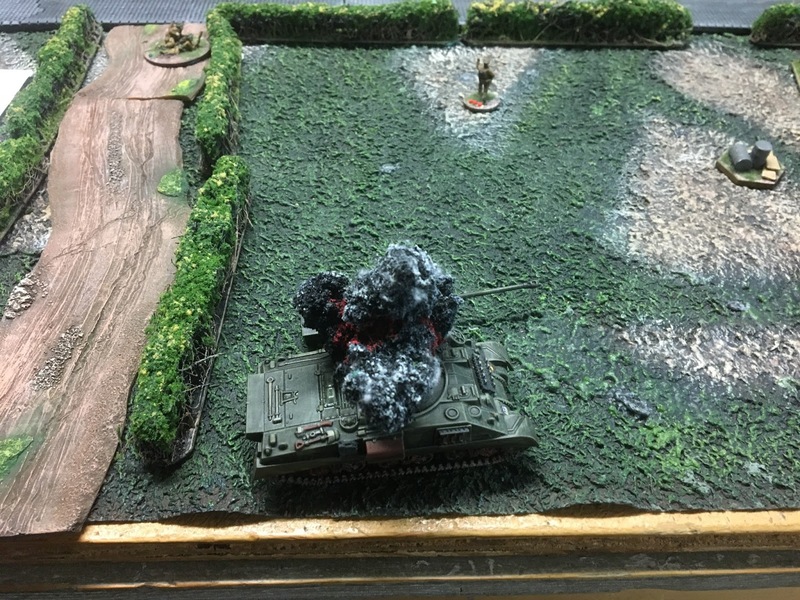 The Panzer fires back, and hits the damn thing twice, Shock forces the crew to abandon the tank and now my FM is down to 5. 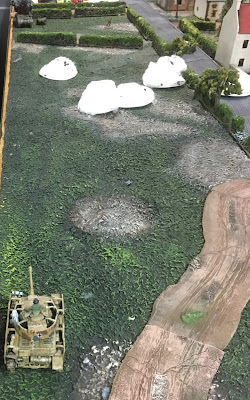 Mike has now advanced his FO and one panzergrenadier squad through the forest on his right flank, I manage to cause some shock and wound a JL, we fire back and forth, my section is the first to get pinned, as he now gets some double 6's on his command throws. He also gets of his off table mortar which envelopes two of my JOP's. I have one section in reserve and he has 2 squads in reserve. Decision time...........I use my one Chain of Command dice to end the turn and withdraw my troops successfully. I have only lost 3 men and Mike one, but I can see that I am not going to be able to force the Germans off the table. Another German victory. The section gets stuck in but get pinned first by the PGs. First time the Firefly has seen a game and up it goes. 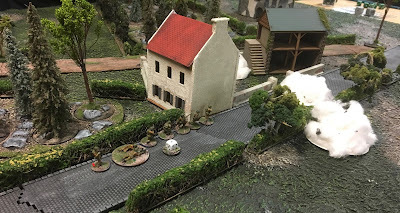 The German off table mortar closes off the centre of the table. Mike played a great game and really stymied my advance. I could whine about losing both tanks but that is how it is, I do not think my plan was bad. If I took out the Panzer IV I would have been able to advance both tanks up my right flank. 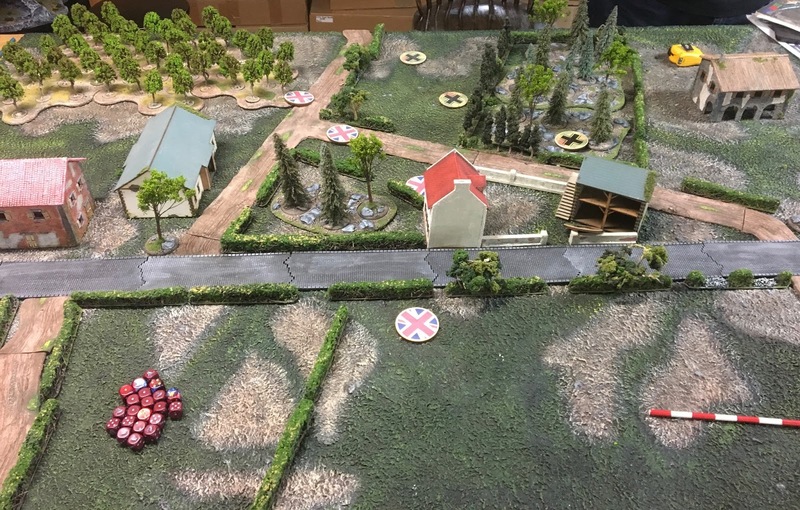 We are hoping to get our next game in the first week of January, I really need to get off table 2 and only have 7 more turns left to move through 5 tables! Mike's +4 throw on the FM is going to continue to be a real killer. What a splendid table...and map! Great stuff! A shame about the Firefly, but it is a gaming tradition that the new unit/model routs or is destroyed in its first game. Yes it does appear to be the tradition for new weapons! 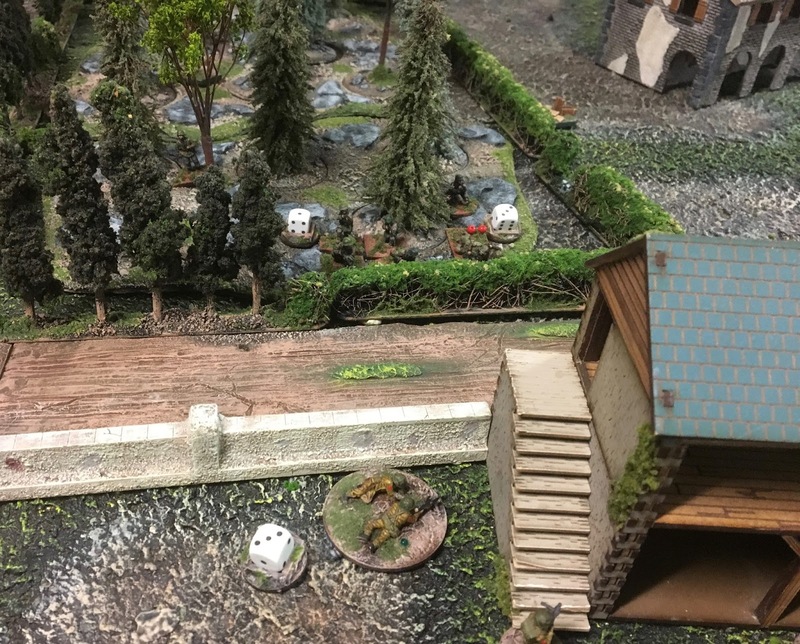 Lovely terrain and good report. Not a fan of CoC but it does seem to have more realistic 'campaign' support than the other WWII game. The campaign game is a game in itself the CoC rules are just a tool to play the game. AJ is correct. SOP: Brand new = Brown bread. Good looking game. Nice action.